All boys and girls love snack! Now what if snack could be served in a way that creatively reinforces the theme of redemption and service? Then it’s not just about feeding kids so they don’t run on empty stomachs, but also about teaching them a valuable lesson. The other day I tried something new, and it worked… here it is; it’s called Push Ups for Donuts! Before the teens got to snack, I made sure that a whole variety of snacks were laid out in an elegant fashion on top of a table. I setup chairs in an auditorium style and asked the teens to sit down as they came in, without grabbing any food. After praying a blessing over the food, I told them that today snack was going to be a little different. I told them I needed a “volunteer with a big heart”, who would be willing to serve others before himself. After a few moments of hesitation, Jack raised his hand to volunteer. So I had him come up to the front of the room and explained to everyone that every item on the table costs 5 push ups, whether it was a hard snack, a small chip bag, a glass of lemonade, a small bag of starbursts, an apple or orange, et cetera. In order for a teen to get his snack, he would choose out loud what he wanted to eat, and then Jack would have to do the equivalent number of push ups. If he chose 2 snacks, then Jack had to do 10 push ups. If he chose 4 snacks, Jack would have to do 20 push ups. One by one, the whole room, including parent volunteers, chose their snack, and Jack did the corresponding push ups. A few, feeling guilty for Jack, did not want snack. But Jack did 5 push ups for them anyway and donated them a snack of his own choosing instead. Others had no pity! Towards the end, Jack was noticeably sweating and in pain, especially since he had to remain in push up position. At the end, Jack chose his own snacks, did the corresponding push ups, and then everyone clapped for him. Once he had finished, everyone was now allowed start eating their snacks. 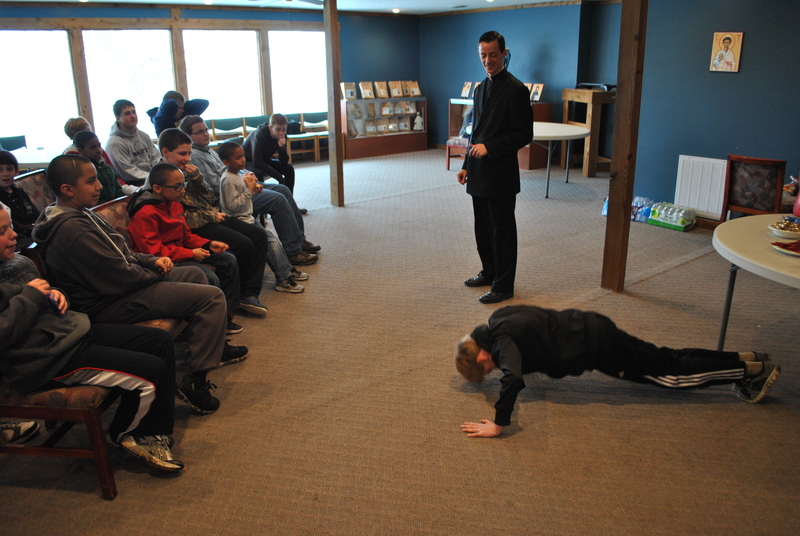 At that point, I read them the story of Brother Christian and his activity called “Push Ups for Snacks”. I read the story as they ate. (Click here for story and activity instructions.) The story is the same scenario, except that it correlates the activity with what Christ did on the cross for us. Christ had to carry the cross for each one of us, whether or not we would take advantage of the graces he was earning for our salvation. Before snack, I had deliberately talked to them about the passion and death of Christ, so this helped bring those concepts alive. All the teens were quite taken aback by the message and experience, and even some of the parents. They still remember that activity today, even after a few months, and we’ll probably do it again someday. Of course, I’ll choose someone other than Jack to do the push ups! This could also have been done with a girl, although I have seen them do sit ups instead of push ups. 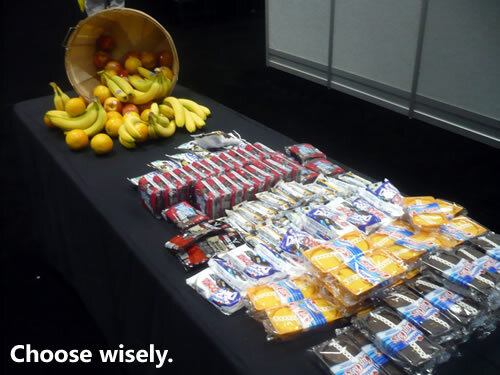 Be careful how many push ups or sit ups you ask the volunteer to make per snack. It’s important that he or she be able to finish for everyone! Happy snacking! Picture of another group doing push ups for snacks. Posted in Activities, LentTagged activity, adolescence, faith formation, formative activity, group activity, Lent, redemption, resource, retreats, showcase ideas, snack, teambuilding, youth ministryBookmark the permalink. Awesome activity Br. Lucio! I love the creativity and message! Thanks Todd! I actually learned this from one of my last year’s RC missionaries.